All change leaders and agents will confirm that change goes together with resistance. In the book “Switch: How to Change Things When Change Is Hard” by Dan and Chip Heath is the metaphor of the elephant and the rider described. The rider is the rational side of man, the elephant expresses the emotional side of man. The rider wants to go somewhere, but he has to control his emotions. It looks like the rider is always in control, but because of the difference in size, the impact of the rider is small. This is no problem when the rider and the elephant want to go in the same direction. When the emotions run out of hand, the rider looses control and no rational reasoning will help to calm down the emotions. The emotions are like an elephant on the loose and the first thing to do is to get the emotions back under control. You can recognize this in situations where you have taken decisions, blown up bridges, etc when your emotional side took over (and which you probably regret now). Eg. driving through a red light when you were in a hurry. 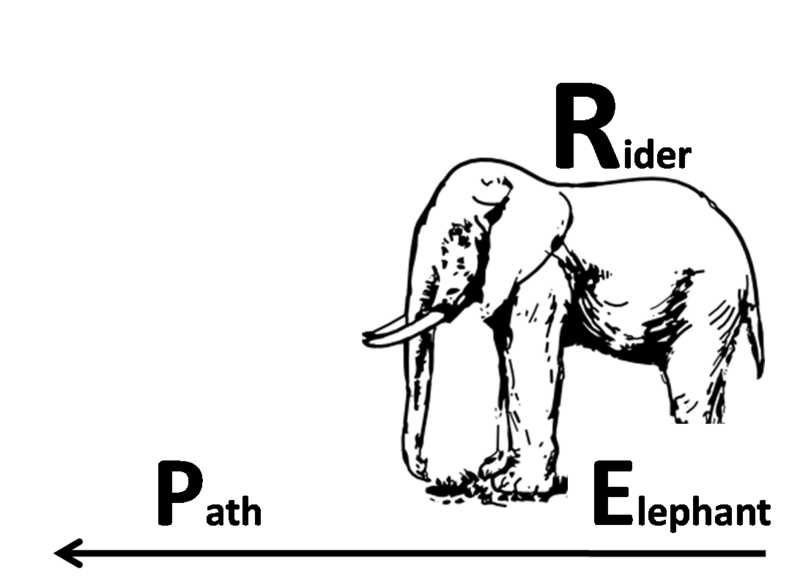 The elephant-rider metaphor helps to understand and relate to people who are in resistance during change efforts. When their emotions take over, there is no need to provide rational arguments: they will not be able to take over control. A more obscure example is a person who’s going to commit suicide by jumping of a building. His emotions have taken over control and few to none rational arguments (“you have a great family”, “you have a nice job”, “people are dependent of you”, etc) will make him change his mind. You can apply a lesson which is learned from horse farming. When a horse breaks loose, you cannot pull the rope and get it to return, you will have to walk along with it for a while and gently lead it back to its stables. Show some empathy and try to understand, but don’t give all your rational arguments because they won’t have any effect.